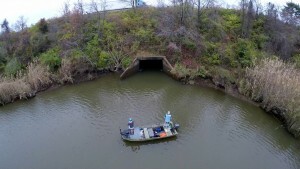 Woody’s Hole is a place on the Delaware River where the bass go when the weather turns cold. It’s affected by the tide and it has a lot of current running through it. We named it Woody’s Hole because a guy named Woody found it, not because it’s full of wood or anything like that. We fished it in late fall. The fish were starting to move in but they weren’t stacked up yet. 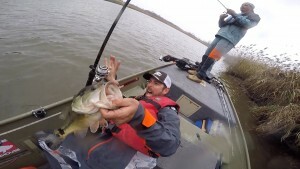 Our trip is a great lesson in how to catch fish with finesse presentations in heavy current. We fished shaky heads because you get two presentations with each cast. The first look the bass get is on the initial fall. It’s a kind of gliding presentation, almost like the old Charlie Brewer Slider Heads used to give us. That’s when a lot of your bites will happen so don’t just throw your bait out and do something else while you’re waiting for it to fall to the bottom. We used my Rugby Heads made by VMC in 1/8 and 3/16-ounce sizes. They do much the same thing as Brewer’s heads do except that they have a slightly different design. Part of that is that they have an extra wide gap, offset hook on them so you can rig them weedless. Our bait choice was a Havoc Bottom Hopper flat sided worm. I like to bite a little bit off of the nose before I thread it on my hook. Most worms have a rounded nose. The Bottom Hopper is no exception. When I bite the head off I’m left with a flat front. That gives it a snug, gapless fit to the head. 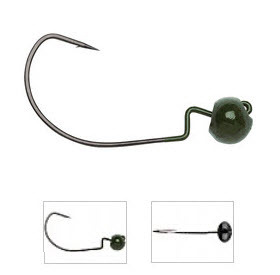 It also shortens the worm just a little so I have a slightly smaller overall bait. Our color choice was a June bug hue or something with a lot of purple in it. That’s a traditional color on the Delaware River. Certain colors seem to work better in certain lakes. So, if you try this technique go with whatever works in your waters. You might wonder why we didn’t just rig the worms Texas style with a slip weight. Here’s the deal — a standard Texas rigged worm will fall straight down to the bottom. We wanted the glide I just talked about. Another thing is that a Texas rigged worm will lay flat on the bottom when it’s still. That’s OK if you’re over rock or something hard but the Delaware has a silt bottom. The worm disappears when that happens. With my Rugby Head the tail of the worm has a tendency to stay up away from the bottom. That makes it more visible to the fish which will get you more bites. My rod choice is an Abu Garcia 6-foot, 6-inch medium-heavy spinning rod I designed just for this type of fishing. I mounted a 20 size Abu Garcia Revo spinning reel to it and spooled up with 8-pound-test Berkley Trilene 100% Fluorocarbon line. The light line was important. You want as much natural movement as you can get with this rig. All that’s important but the way we fished was even more important. The only way you can get into Woody’s Hole is through a culvert and even when you do get in you’re faced with a serious amount of current. It’s so strong that the fish can’t live in it all the time. They have to have a place to rest and regroup physically as well as eat, and that’s where they’re the most vulnerable. Sometimes we used the culvert itself as a current break and target. At other times we tossed our baits behind big rocks that were on the bottom. I’ve fished this area many times so I knew where those rocks were and how to get behind them. If I hadn’t known that it would have taken us a while to find them but we would have spent the time to do it. Throwing a finesse bait like we were directly into the current would have been a waste of time. The bass weren’t there. The setup I’ve described and the way we fished it is a great way to deal with heavy current. Try it the next time you’re faced with that kind of scenario. You’ll be surprised by the result.